How Intelligent is Google Today? Progress does not stand still, especially when it comes to web technologies. Since 1998, Google has turned from a primitive machine, recognizing only words, into a human-like brainbox understanding the context. It means the times of keyword stuffing are long gone, never to come back. If you load your content with exact-match keywords, get ready for a penalty from the ruthless Panda algorithm that’s been on the lookout for keyword manipulations since 2011. Even so, you have to take a new, more human-oriented approach. Learn what Google prioritizes in content today and how to research keywords in line with its demanding algorithms. Google is a notorious perfectionist that’s constantly looking for ways to improve the user’s experience. But what is better for users can be a headache for website owners. One day, they wake up to find a sudden traffic drop because Google rolled out a new algorithm update. When doing keyword research, you must take the major algorithms dictating the rules of content creation into account. Panda came into play in 2011 to penalize sites for duplicate content, spam, and low quality posts written around specific keywords. However, content mills were not the only ones affected. As a result of the Panda 4 update, larger sites like eBay that ranked in the Top 10 for some seed keywords fell out of there. With the rollout of Hummingbird in 2013, Google put user intent above wording. Pages reached the top for queries even though they didn’t contain exact words typed into the search bar. It happened because the engine gained a better understanding of what users had in mind. This means it started delivering long, in-depth answers to the questions of all users. RankBrain is an artificial intelligence system based on machine learning. It was launched in 2015 as part of Hummingbird. When RankBrain comes across a never-seen-before query, it can guess what words have a similar meaning and filter search results according to their relevance. RankBrain was confirmed to be the third most important factor in Google’s ranking algorithm. With the launch of these algorithms and their regular updates, there’s nothing left of the primitive mechanism which understood nothing but separate words. Let’s play with search results a little bit to get into Google’s braincase and see what it’s capable of today. Imagine you want to buy a new fillet knife. If you type this query in the singular, Google will show you a lot of results in the plural. Let’s say you need a DIY guide on how to install an antenna. It means Google ignores suffixes and endings. If you are looking for, say, a marketing agency in Los Angeles, you can shorten the city name to LA. Google will get your point. If a page is relevant for “gear,” it’s relevant for “equipment” and other similar words. 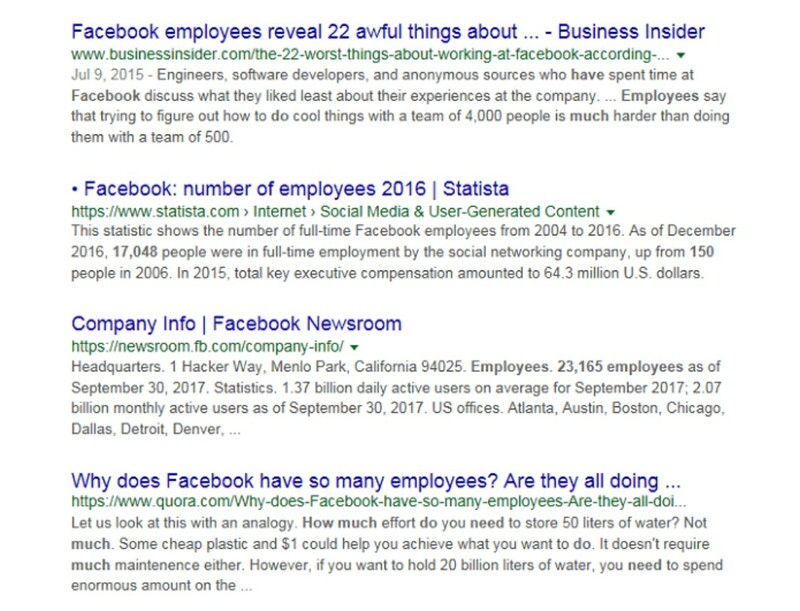 Whether you use a short query “number of Facebook employees” or the entire question “how many employees does Facebook have,” you’ll get pretty much the same organic results. But you may not even scroll that far, as Google knows the answer and shows it above organic results. Although Google doesn’t focus on exact-match queries anymore, your content still needs keyword optimization at some point. Check out the main steps to find keyword ideas that will work in the post-Hummingbird era. As Google sets a priority on the user’s intent, it makes sense to start keyword research with your target audience. Think of how you can answer people’s questions instead of how to rank for a certain query. Users browse the web to find solutions to their problems, not your products. Let’s say your company develops PrestaShop themes. This means that your target audience are people who want to build an online store without hiring costly web developers. If it’s someone who’s tech savvy, they’ll probably use “PrestaShop themes” as a search query. But what if it’s someone who crafts jewelry in their spare time and wants to monetize their hobby? How high are the chances that such a person knows about ready-made themes or what PrestaShop is? If people have no idea about the existence of your product, they won’t type its name into Google. While some users are clueless about your products, there is a category of people who do know about them. To target product-aware prospects, make a list of your seed keywords. “PrestaShop themes” is a too broad keyword to compete for. Try to be more specific using its long-tail variations. Long-tail keywords are words or phrases that have a narrow meaning and a low search volume. On average, they get around 30-80 searches per month. Note that while the volume of a long-tail keyword variation is low, its collective volume can be quite high. That’s because users write the same query in different ways, e.g. synonyms, different word forms, etc. As Google doesn’t bother about that, you shouldn’t either. Go to Ahrefs Keywords Explorer, enter your seed keyword, and filter results by their search volume. Opt for up to 70 searches per month. Every niche has top players you should learn from, as they already rank for a lot of your target keywords. You can find out which keywords bring them more traffic and use them in your content too. To check out your competitor’s keyword base, use this handy SERP checker in Ahrefs Keywords Explorer. Next, click on the number of keywords to see them all in Ahrefs Site Explorer. Borrowing competitors’ keywords is a rewarding SEO strategy, but you should know where to draw the line. What’s the point in thousands of pages covering the same topics? It’s so annoying to jump from one site to another and read the same stuff re-written with different words. To build a loyal audience, you must provide unique value. That’s how readers will distinguish you from all the others. Look for unique keywords that your competitors haven’t used yet. There are some free tools that will help you find them. Let’s try Answer The Public. It can generate a huge list of question-based keywords in the long-tail form. The tool is perfect for getting more ideas of search intents your target audience may have. Another free tool with a large keyword database is Ubersuggest. With its help, you can browse keyword ideas alphabetically and expand each of them to get even more variations. Your keyword research will give you so many options that you may wonder which of them actually work. 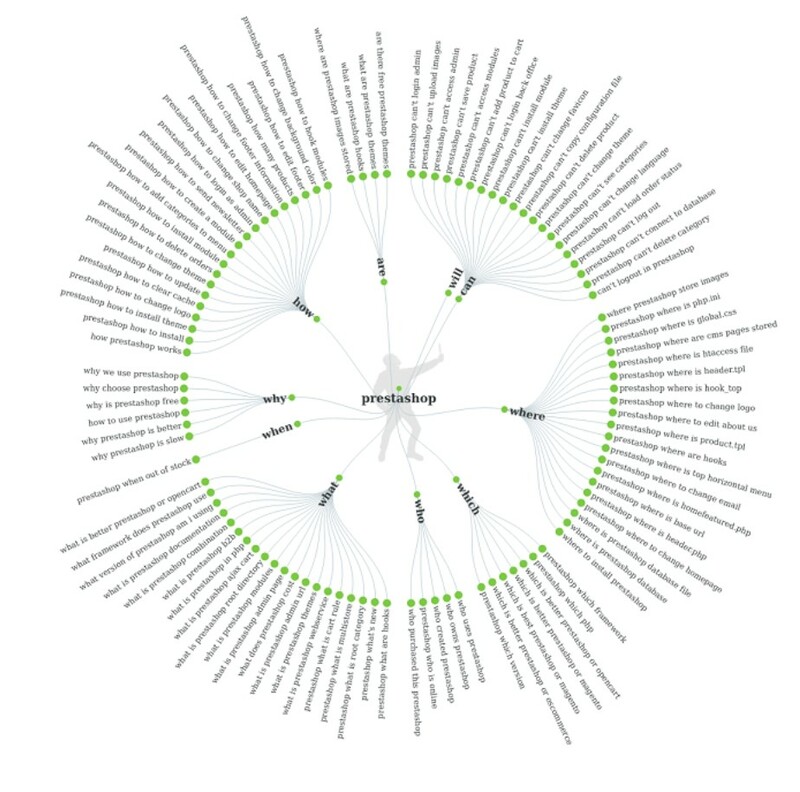 Here are the major metrics to consider when choosing keywords for your content. This metric shows how many times people type a certain keyword into Google per month. The higher the volume, the more traffic it can drive. Even though I recommend using keywords with a low search volume first and foremost, keywords with a higher volume can be of great use too. 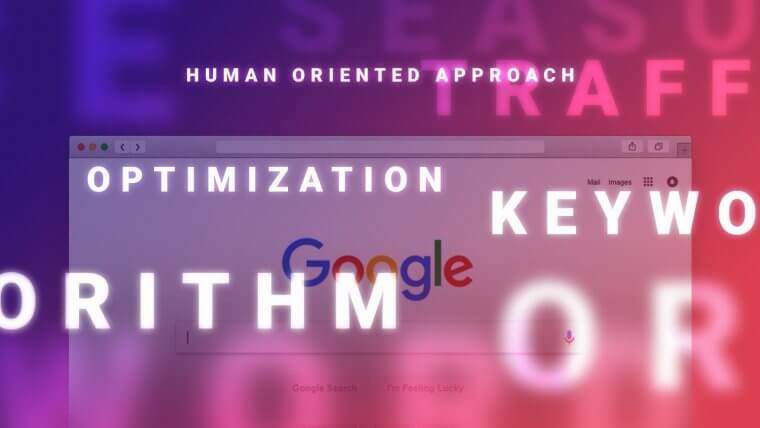 What you need to keep in mind is the seasonality of keywords. If your content refers to something that can be used throughout the year like PrestaShop themes, there’s nothing to worry about. But if you deal with seasonal items like Halloween costumes, most people will search for them only before the holiday. As you can see, this keyword has a monthly volume of 580K, but the data is a monthly average for 12 months. Before Halloween, this metric grows even higher. Once the holiday is over, it drops and stays low during the rest of the year. To check the seasonality of keywords, use Google Trends. Not all keywords with a high search volume can generate a lot of traffic, even if your site ranks #1 for it. Let’s say you posted an article about Hillary Clinton’s age. Here’s what your audience will see in the SERP for such a query. There is no need to scroll down to organic results and visit your site, as Google shows an instant answer. These types of keywords won’t bring you that much traffic, even though the one I used as an example gets 99K monthly searches. The instant answer is a SERP feature called Knowledge Graph. Today, Google has more than 15 SERP features that all steal traffic from websites. Before choosing a keyword, learn how many clicks it gets in Ahrefs Keywords Explorer. To double-check things, type the chosen keyword into Google and see how it delivers results for it. This keyword metric reveals how hard it will be for your content to appear in the Top 10. The lower the difficulty score, the easier it’ll be for your site to get to the top of search results. If you are just starting out, you’d better stick with low difficulty keywords. As you earn more authority, feel free to switch to keywords with a higher difficulty score. 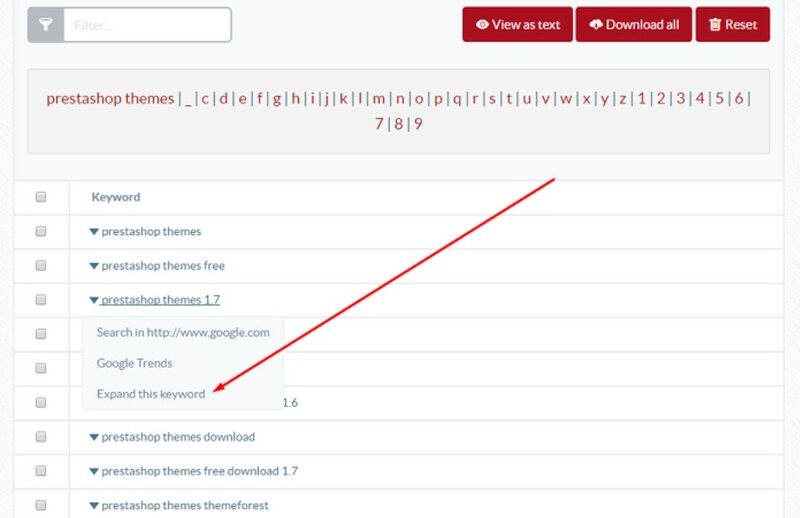 You can view the keyword difficulty score in Ahrefs Keywords Explorer and also learn how many backlinks your site needs to rank in the Top 10 for that keyword. In the end, you will come up with hundreds of keywords. If you don’t want to get lost in such a large number, try to group them by categories. Note that these are just examples. You will come up with your own categories depending on your niche and products. Although Google is smart today, you can outsmart it with your human brain and some wit. Now that you know the major steps to research keywords in line with Google algorithms, traffic is not long in coming. No matter what niche you’re involved in, these guidelines are universal for all. 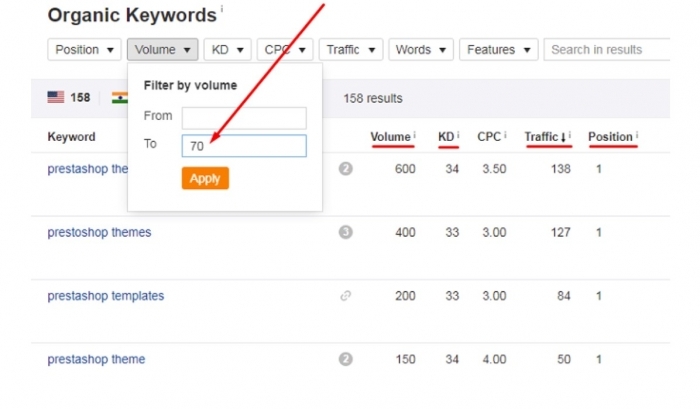 Can you recommend any other strategies to maximize the efficiency of keyword research? Feel free to share them in the comments to this post!